As much as we get to Napa, we have not spent a lot of time in Russian River. Our friend Steve had mentioned that he was taking his girlfriend Malia wine tasting in Sonoma. We coordinated meeting them and since he’s the local, we let him lead the way and were confident that his choices would be great. We visited five estates that Sunday and the one we enjoyed the most was Thomas George Estates Winery. 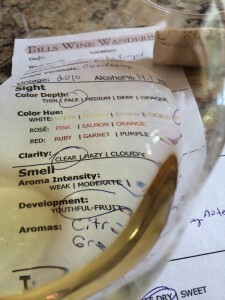 The Pinot Noirs were excellent! As were the Chardonnays. The good news is we joined the wine club but that meant another wine club would be receiving the dear John letter of cancellation. Young-fruity, citrus, buttery, creamy notes, green apple. The Chardonnay was not dry. It was medium-bodied and the acidity was lively. This chardonnay was barrel fermented giving a rich creamy mouth feel in the mid-palate with a medium finish. Region/Appellation: Russian River from the Starr Ridge Vineyard. Wine makers notes: Barrel fermented in 70% French oak (20% new), 24% concrete egg, 6% stainless steel, aged surlie with 15% malolactic fermentation (second fermentation). 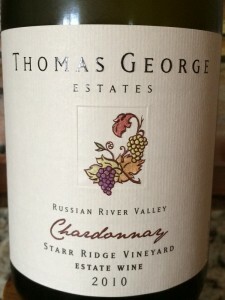 I rated the 2010 Thomas George Estates Chardonnay four glasses. A great find in Russian River.